One of the most intriguing characters of the Cold War period was that of the double secret agent. A double agent is a member of a secret service whose primary aim is to spy on an enemy but who is also a member of the secret service of that enemy. Double agents could be spies who were previously loyal but who switched sides and were often used to transmit disinformation or to identify other agents as part of counter-espionage operations. A great example of a British spy who was turned was George Blake, a double agent in the service of the Soviet Union. What kind of chart would we expect from a double agent ? The capacity to work and live on many different levels, to be secretive to an extraordinary degree and to be able to play a high stakes poker game with the lives of many people including their own without for one moment revealing their hand, the one sign most qualified for this job would have to be Scorpio. There would also have to be ability to maintain some kind of precarious balance holding two extremely powerful opposing forces in check which might suggest a Libran or 7th house influence. They would need to have a tremendously strong sense of themselves in order to function under these conditions which might point to Leo and be brave and courageous like an Aries. More than any of this they would certainly need a strong Neptune as their whole lives would be based on mystery and illusion. George Blake had all the ingredients. His Sun was in Scorpio in the 7th house in very close square aspect to Neptune. Neptune played a big role in his life as it was also conjunct the Moon in Leo and of course Aries is rising. This isn’t the complete picture however. Blake’s Moon / Neptune conjunction is part of a T Square. The Moon and Neptune together easily gives the impression of someone who is not what they seem, in Leo in the 5th house almost points to a kind of James Bond figure with an extremely strong confidence and sense of themselves ( Leo ) with a love of partying and the high life ( 5th house ). Blake’s Moon and Neptune are opposite Mars which is bound to be strong in the chart of someone involved in military intelligence. Mars is in the ideological Aquarius in the 11th house of political ideals. 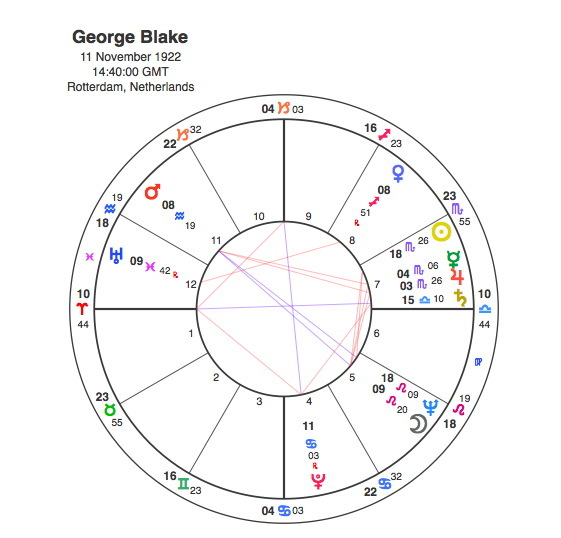 So Blake is pulled in two directions – he wants to lead the Bond type life ( Moon / Neptune in Leo in the 5th ) but has to square that with powerful and unorthodox political views that he is forced to act on ( Mars in Aquarius in the 11th ). This opposition creates a T Square with 3 apex planets and throws its energy onto the Sun, Mercury ( intelligence ) and Jupiter ( large foreign power ) all in the secretive Scorpio in the 7th house. In mundane political astrology which looks at the charts of nations the 7th house rules the enemy. It seems appropriate to see the 7th house in Blake’s chart in this way rather than in terms of marriage. So George Blake is astrologically turned to become a double agent for the opposing side. There is another T Square in Blake’s chart from the Aries Ascendant opposite Saturn also in the 7th house focusing onto Pluto in the 4th. This is further testimony of Blake’s courage and assertiveness ( Aries ) but also that it puts him into extremely difficult and testing situations against very strong authority figures ( Saturn ). This projects onto an apex Pluto in Cancer in the 4th, a perfect symbol for an underground revolutionary and subversive operator ( Pluto ) who betrays the country ( in Cancer in the 4th house ) he’s supposed to be working for. The only problem with a double agent is actually working out which country that is. 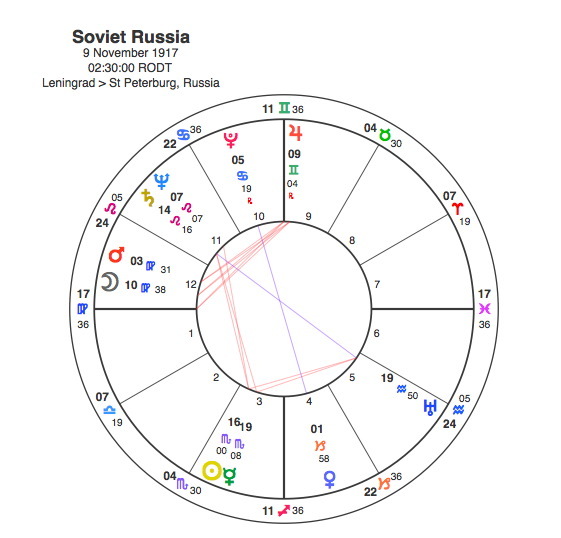 This chart is for the moment during the Russian Revolution that Lenin’s Bolsheviks seized power and is used as the defining chart for Soviet Russia. George Blake’s Sun is in close conjunction with the Russia Sun at 16 Scorpio so there’s a natural affinity there. Blake’s Moon is also closely conjunct the Russian Neptune which simply makes him one of their spies ( Neptune ). This was not always the case. During and after World War II, Blake worked exclusively for the British, translating German documents captured by British agents and interrogating captured German officers. Following a crash-course in Russian at Cambridge University in 1948 he was posted to the British embassy in Korea to try and establish an agent network in that country. This literally was the turning point of his life so its no surprise to find that Pluto was transiting square his Sun from the date of his capture to the end of 1951. Of course Blake has a close Sun / Neptune square natally so Pluto was also conjunct his Neptune at the same time. What better transit to define the turning point ( Pluto / Sun ) of a secret ( Neptune ) double agent’s life. Following his release in 1953, Blake returned to Britain as a hero. In 1955 he was sent by MI6 to work as a case officer in Berlin, where his task was to recruit Soviet officers as double agents. It was here that he made contact with the KGB and informed them of the details of British and American operations. In the course of nine years he betrayed details of some 400 MI6 agents to the Soviets, destroying most of MI6’s operations in Eastern Europe. In 1959, Blake became aware of a CIA mole working in Russia, and was thus instrumental in exposing P. S. Popov, who was executed in 1960. In 1961 he was exposed as a Soviet agent and arrested. The maximum sentence for any one offence under the Official Secrets Act is 14 years, but his activities were divided into five time periods and charged separately. He was sentenced to 42 years imprisonment, the longest (excluding life terms) ever handed down by a British court up to that time. As this was the moment Blake’s secret activities were brought into the light it was most appropriate that the transiting Neptune was square his Sun in 1961. Five years later, in October 1966, Blake escaped from Wormwood Scrubs prison with the assistance of three men whom he met in jail, Sean Bourke and two anti-nuclear campaigners, Michael Randle and Pat Pottle. Their motives for helping Blake to escape was their belief that the 42-year sentence was “inhuman” and because of a personal liking of Blake. In 1966 Neptune, the planet that symbolises escape along with other secret and mysterious activities, was conjunct Blake’s Sun. He then made his way to the Soviet Union where he has lived ever since. In 1990, after the fall of the Berlin Wall signifying the end of the Cold War, his autobiography ‘ No Other Choice ‘ was published. The book’s British publisher had paid him about £60,000 before the government intervened to stop him profiting from sales. It’s only fitting that Pluto was conjunct his Sun in 1990, the moment he got to tell the world the story that began when he was turned by Pluto’s only other transit to his Sun, the square in 1951. George Blake denied being a traitor, insisting that he had never felt British, “To betray, you first have to belong. I never belonged.” He belonged to Soviet Russia as the conjunction between their two Suns demonstrated. If the Secret Service want to check whether one of their agents is really on their side all they have to do is look at their birth chart. The only problem is, can a double agent be trusted to provide the right birth time and date ?